the happygirl: charming things: slurpee lite is here! charming things: slurpee lite is here! Today- May 23- it's SlurpFree Day at 7-Eleven! Get a FREE 7.11 ounce new Sugar-Free Mango Slurpee! The summer after 5th grade (and Sr. Susan) will always be known as Slurpee Summer. This was the June that our parents let us roam free on our bikes, trusting that we as ten year-olds were mature enough to stick together and stay out of traffic. And so, my best friends Kate, Susie and I would ride our pink bikes with streamers in the handlebars (and playing cards stuck in the wheels so we made click click click sounds when we rode) around our neighborhood flying down McKinstry Avenue past the farm stand with the good blueberries and the Gilpatrick's farm. Up the hill we road, sweaty and on a mission, for at the top of the hill was 7-Eleven and cherry Slurpees. With hot quarters from our sticky palms we proudly paid for our red icy treats. We sat on the curb with our bikes parked neatly near each other (after all, we did go to Catholic school and learned that neatness was next to godliness.) We were quiet there sitting in the sun with our thighs burning against the hot curb, as we sucked on the Slurpees. It was always a contest to see whose lips were stained the reddest. Susie with her white blonde hair and blue eyes always won. 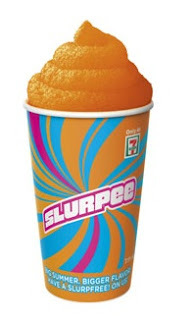 When I read the news this week that 7-Eleven was coming out with a lite version of the cold treat (20 calories for 8 ounces) my heart skipped a happy little beat. Starting early this summer, 7-Eleven will roll out their Fanta Sugar-Free Mango flavor (with Splenda) followed later by Strawberry Banana and Cherry Limeade. While no nutritionist would tell you to go willy-nilly with a giant Slurpee, an 8-ounce sugar-free treat is lovely once in awhile. Go on. Be a kid. What's happier than a Slurpee on a sunny day?